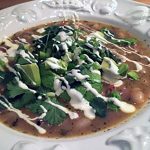 This soul-satisfying White Bean Chili recipe combines chicken or turkey, with white beans and smokey, fire-roasted green chilis, resulting in the perfect white chili. There is something wonderful about a warm bowl of flavorful chili on a cold evening. This recipe never fails to deliver; and recently someone, who remembered having it over a decade go, reached out to me to see if I still had the recipe. It really is that good. Lucky you – I only share it with my close friends. As with all my recipes, I like to combine and reduce steps, making them easy to follow, flavorful and quick to the table. Life is busy, and most of us are tired and hungry at the end of the day; so simple, tasty recipes make life easier. This is the perfect dish to pull together on a Sunday afternoon. It is delicious the day you cook it, and even better a day or two after. The recipe makes enough to feed friends while watching football, and still have enough to freeze for later. This Christmas a friend sent us a gorgeous Greenberg smoked turkey from Tyler, Texas. It was delicious on Christmas, and I decided to make good use of the leftovers with a big batch of white bean chili. It turned out to be simply amazing. 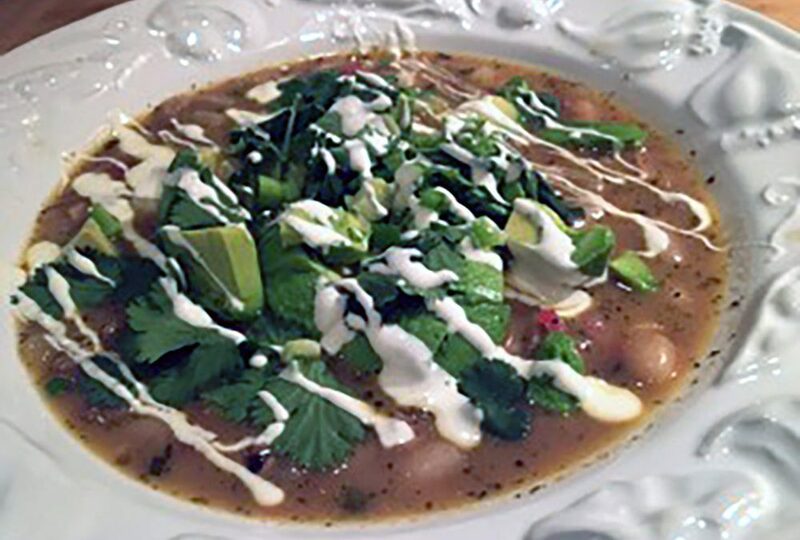 So good in fact, that I felt my White Bean Chili should be the first in a series of special recipes that I will be sharing only with my subscribers. Just a few notes about the recipe. This is a versatile recipe that uses pre-cooked poultry. You can either cook some chicken or turkey, use a store bought rotisserie bird, or make good use of leftovers. If you want to make a vegetarian version, swap out the meat for an equal amount of pre-cooked farrow. I always encourage you to use organics whenever possible; especially free range, antibiotic free, humanely raised meat and organic beans. diced avocado, sour cream, salsa, chopped scallions, cilantro, jalapeños and sliced black olives. This is one of my all time favorite recipes, and I hope you enjoy it as much as my friends and family do. Heat olive oil in a large heavy stock pot, add onions and garlic stirring until translucent. Add the broth, cumin, oregano, cloves, chili powder and cayenne pepper. Bring to a simmer and add beans, chilis and diced tomatoes. Gradually add shredded cheese to the bean mixture, stirring between each addition to incorporate, melting the cheese into the mixture. Add chicken or turkey to the bean and cheese mixture stirring occasionally while the meat warms up. Adjust the seasonings. I often add more cumin and sometimes cayenne to make it more spicy. Serve with lots of fun toppings and some blue corn chips to complete the presentation.